When Samsung’s 65-inch curved LCD smart TV powers on, an angelic choir hums a joyous tune in the background and a glowing aura shines forth into the darkening winter sky. Okay, I’m exaggerating. All it really does is make that typical fuzz-buzz sound that every other TV does. But I’m convinced that 65 inches is the ideal size for most home-entertainment environments, unless you have the room and the money to convert your den into a movie theater. Everything on Samsung’s UN65HU9000 looked absolutely glorious. You could watch a porcupine waddle into a swamp on this set and find it totally appealing. Like LG’s 55-inch curved OLED ( model 55EC9300), the edges of Samsung’s display bend toward the viewer just a bit (being larger than the LG, the Samsung’s curve is slightly more aggressive). The curve also helps reduce glare a bit. I’ve read some reports that claim curved screens distort the displayed image, but I never noticed that problem. The large icons make it easy to find the apps your're looking for without needing to do a lot of drilling down. Unlike LG’s set, the Samsung set delivers full 4K resolution, and movies like G.I. Joe: Retaliation took on a crisp, life-like appearance (sadly, the acting remained as wooden as a pine tree). Games look just as impressive on the UN65UH9000. In one memorable scene from Assassin’s Creed Unity, I stood inside the virtual Notre Dame de Paris cathedral and looked up, and the curve gave the scene a cocooning, eyes-wide-open look that wouldn’t have been possible on a flat screen. The Samsung uses a more conventional LCD panel with LED back-lighting around the edges of its screen. It does a very good job of producing deep blacks, but it can’t compete with the OLED technology that LG uses because the 55EC9300 can turn individual pixels completely off. The Samsung produced deeper and darker blacks than I’ve seen on most other LCD sets. In the end, both the LG and Samsung TV delivered phenomenal contrast. Samsung provides two remote controls with this model. 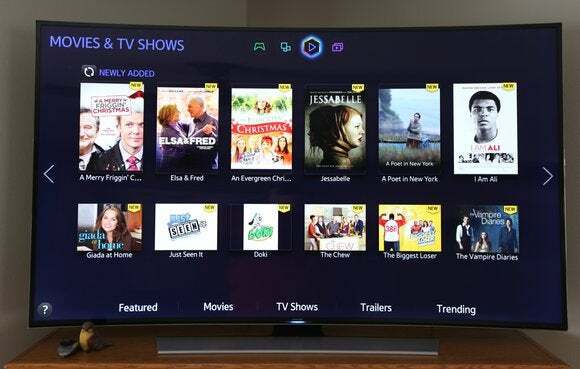 One is designed to operate like a mouse for choosing from the boatload of provided apps, which include everything you’d expect: Amazon Instant Video, Hulu, Netflix, Vudu, YouTube, and other video-streaming offerings; plus, a broad selection of games). Samsung has also signed deals with some pay-TV services—including Comcast and DirecTV—to support 4K TV programming. If you’re a customer of those services, a Samsung TV might be your only means of accessing their 4K content for a while. The second remote control, by the way, is more of a traditional finger-masher for changing the volume, input source, and other settings. 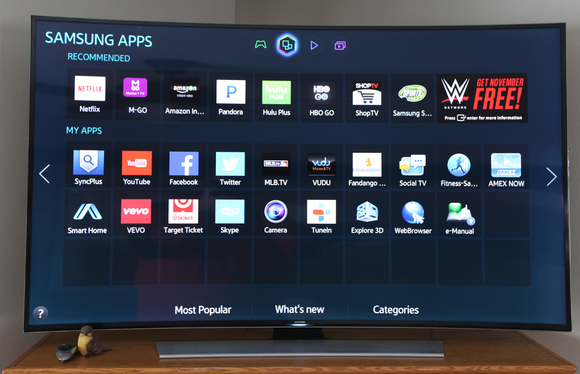 If you want to watch 4K TV, Samsung locked up some early partnerships with DirecTV and Comcast. The UN65HU9000, like most HDTVs these days, has an onboard Wi-Fi adapter, but it also has an ethernet port for hard-wired connections (if you have a ethernet port nearby or are using an 802.11ac wireless bridge). But nearly all of this TV’s input/output ports are inside a box that’s separate from the TV itself. This could complicate matters if you’re mounting the TV to the wall, as you’ll also need to find space for the breakout box. The box has four HDMI 2.0 ports, two USB ports (there’s a third on the TV itself), a coax connection for a cable TV or an over-the-air antenna, and a proprietary component video/analog audio connector. Samsung supports Miracast (but not WiDi) if you want to stream audio and video from a laptop PC. 3D TV might be dying on the vine, but the UN65HU9000 still supports the technology. As limited as 4K video material is today, there’s even less 3D 4K video. Still, if you invested in a 3D Blu-ray player, Samsung has you covered (as long as you don’t mind stepping down to 1080p resolution. Samsung provides four pairs of its active-shutter glasses, which are more effective than the passive glasses LG and some other TV manufacturers are using. On the other hand, active-shutter glasses depend on batteries that might die in between the few times you actually want to watch 3D content. Samsung’s suggested retail price for this TV is a stunning $6,000. That dropped to $4,500 when I started the review, but it fell to $4,000 by the time this review made it through my editor’s hands. That’s $500 more than LG’s 55-inch model 55EC9300, but you’re getting an additional 10 inches of display area, 4K resolution compared to 1080p, and active-shutter 3D glasses where LG uses passive technology. Having said that, I think the OLED technology LG has embraced is superior to the LCD tech in Samsung’s panel. In the end, if you have your heart set on a 65-inch, 4K display, I think the $4500 LCD Samsung UN65HU9000 is probably a better value than the $10000 OLED LG 65EC9700. But I’d encourage you to compare the two side by side in a showroom if you can, since I haven’t personally evaluated the larger LG.